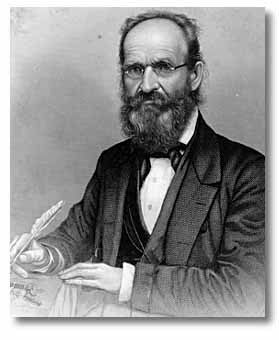 This portrait shows Platt R. Spencer, who developed the Spencerian style of handwriting in the nineteenth century. Platt R. Spencer (1800-1864), born in E. Fishkill, New York, moved with his mother and several siblings to Ashtabula County, Ohio in 1810. He developed a style of penmanship that he called "Semi-Angular Script" but which is more commonly known as "Spencerian Penmanship." His style included not only the creation of letters but also exercises for practicing them, body positions, and particular full-arm movements (as opposed to wrist actions). The exercises were often performed to the rhythm of poetry, which he also wrote. Spencer became involved in establishing business colleges in the United States. His writing system was marketed by mail and taught at his seminary on North Myers Road in Geneva Township, in classes on the road, and in the colleges. His family also marketed exhibition pieces, etchings, ink, pens, and instructional books. The portrait measures approximately 18" x 20" (45.72 cm x 50.8 cm).